In the perfect location for those taking the ferry to Calais less than an hour’s drive away, Le Touquet-Paris-Plage blends French chic and art de vivre with outdoor activities and fresh air to make it an ideal destination for couples, families and everyone who loves to explore the coast of France. First stop on anyone’s list should be the wide, 7km-long sandy beach, lined by colourful beach huts and overlooked by villas dating from the resort’s 1920s heyday, when it attracted Noël Coward and his smart set. Other historic remnants to admire are a 1930s lido with a high diving board, now incorporated into the fantastic Aqualud waterpark, and the restored Canches lighthouse. Climb the latter’s 274 steps as part of a guided tour and you’ll be rewarded, on a clear day, by views of three regions of northern France and perhaps even the famous white cliffs of Dover and Folkestone. At the heart of the resort, the main Rue Saint-Jean is packed with shops, including fashion boutiques, hip homeware stores, and tempting bakeries, patissiers and chocolatiers that appeal to holiday-makers from both Paris and further afield. Here, too, you’ll find many of Le Touquet’s best cafés, bars and restaurants, and one of its two casinos. Meanwhile, the nearby Marché Couvert or covered market – itself a listed monument, built between 1927 and 1932 – is a riot of colourful local produce, including seafood fresh from the boats in its dedicated Poissonnerie section. Make sure to sample some home-made regional waffles as you browse. 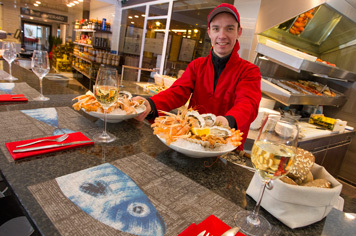 Treating yourself to moule-frites or some locally caught fish is one of the highlights of a trip to Le Touquet and a must-do for those who like to sample seafood in France. You’ll work up an appetite just strolling around this charming town, taking in the sights. But Le Touquet is also blessed with a whole range of excellent sports facilities that will inspired you to get active in the great outdoors – horse-riding in the Canche estuary, tennis, sailing, sand-yachting, cycling in the surrounding pine forest and golf are all on offer, as are walks led by nature guides. The town also hosts a packed program of events, whether you want to take part or spectate, including the vast Enduro beach motorbike race each February, and music and themed festivals galore.